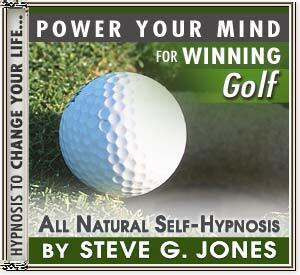 START WINNING GOLF WITH HYPNOSIS! You are Standing at the tee. It is a beautiful day with a clear, blue sky. You feel a slight breeze on your body. You are calm and focused. Your knees are slightly bent. You are looking confidently down the middle of the fairway, picking the spot where you want the ball to land. Your head is down throughout your swing. You watch and feel the club make contact with the ball as you follow through, shifting your weight from your back foot to your front foot in a fluid motion. You watch the ball sail down the fairway and land in that perfect spot. You smile as you advance to finish the job.